Instagram is one of the fastest growing social media hubs out there and we have a pretty good idea why. Remember the time you used to snap Polaroid photos and hand them out to friends and or hang them on the mirror. How cool was that, uh? Even if you’re not a proud 60’s kid, at least you’ve got to have heard about it. Right around 60’s and 70’s, Polaroid had taken over the electronics market turning a simple camera into one of the top-selling items of the century. Bringing photography to the entertainment industry with a whole new perspective for success, the Polaroid camera was an amazing invention which forever changed the way we communicate through technology. That’s a truly remarkable story, in fact, almost as remarkable of the one we all hear about Apple, Facebook and all the other conquerors of online communications. With the rise of mobile devices and social medias taking the throne, the web craved a Polaroid camera of its own and Burbn Inc knew just the right thing to do. Mike Krieger and Kevin Systrom were the guys who saw an opportunity beyond the already crowded market of online photography tools. They created a social hub where people from all layers of the photography society can have a chance and taking a dreamy landscape photo and a mesmerizing view of their back yard without being Photoshop wizards. Years after its launch, Instagram became a place where no taco is too tallowy to become a model and no pet is too cute to become the internet’s next fave. And among the overcrowded hashtags featuring yet another #instalike photo of the day, there are those who choose to skip the filters and put creativity into action with a touch of quirky professionalism. Graphics designers are becoming more and more popular among Instagram fangirls and there sure are worth the visit. Gemma is not your ordinary instagrammer. Besides being the creative mind behind the Spewbag Challenge on Tumblr, where hand-drawn typography comes to another level of awesomeness, she is a model, photographer and a typography whiz which can amaze you with a diverse set of Instagram publications. From handwriting to contrasted snaps of architecture, graffiti and what not, her profile is a triumf of creativeness squeezed into a beautifully laid out photo feed. If creative typography posters, smart color combinations and cheesy quotes are your thing, you should definitely follow Lauren. Being the author of the blog-book “Daily Dishonesty” and a quirky artist who likes to tackle complex typography, this Brooklyn beauty can quickly trap your heart so watch out! Creating design with oddity in mind, Leta sobierajski will amaze you with an uncanny, yet inspiring Instagram photo collection. 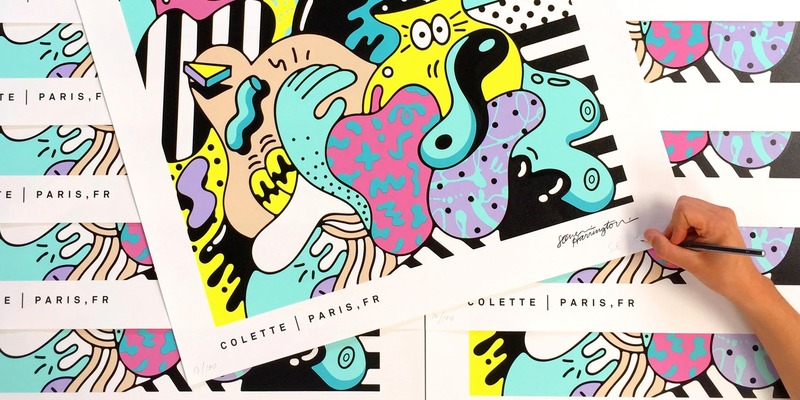 By smartly combining warm and cold color palettes, Leta interlaces the ordinarily of couples portraits with the quirky spirit of partner and fellow designer, Wade Jeffree, to create a provocative and plain funny collage of modern relationships. The 3D illustrator, art director and cat lover, Jacob, offers a diverse selection of graphic art. His inspiration-infused Instagram profile features colorful art, three dimensional design, food photography and much more to guarantee you an unforgettable instagramming experience. If you’re searching for a gorgeous graphic design collection which smartly intertwines photography and unusual color combinations, you’re in the right place. Illustration at its best! Sam’s profile is more than an illustrator’s window to the graphic design society. Everything in Sam’s Instagram feed is created to bring an inspiring dose of beauty to your Instagram feed. The delicate landscape drawings and surreal watercolor art, tinted into a bold color palette, embarks you in another real of creativeness where nature and graphic design build perfectly intertwine creating an experience beyond the ordinary Instagramming.